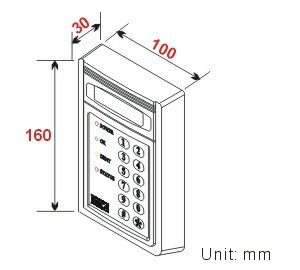 Proximity main reader can be connected to computer to provide online information inquiry/setting, door opening and closing, alarm activation and etc. It can be used as standalone operation. During the operation of the proximity main system, historical data (recording entry & exit information) storage can be reached up to 6,000 batches. When it is being connected with computer, the capacity of recording of entry and exit information is unlimited which records detailed data of the cards. Proximity main system’s maximum capacity for valid cards is 9,000 cards. Each card self set individual password and time zone for entry and exit. The entry and exit control area of proximity main system includes card number, password, time zone, special holidays, status control, and anti-passback. When the reader has detected that the system has been damaged or the door has been opened illegally or the door did not close over a specific time limit, then alarm will be activated. System provides 48 sets of time zone for user to set. Each time zone has five time districts. The system has self hardware testing function when the equipment is power on. When sudden power cut occurred, internal battery would operate and therefore information in the internal memory will not be lost and system timer can be operated as normal. Single proximity or card number entry. Maximum proximity distance: 15cm (125KHz), 5cm (13.56MHz) (depending on types of card). Operation temperature: 0~60℃; Humidity: 85%Rh max.